On March 8th, the Faroe Islands‘ TYR will release their eighth full-length, „HEL“, via Metal Blade Records. Hel is a collection of ruthlessly melodic and irresistibly compelling progressive folk metal that will immediately resonate with any who have followed the band at any point over the two decades of their storied career. 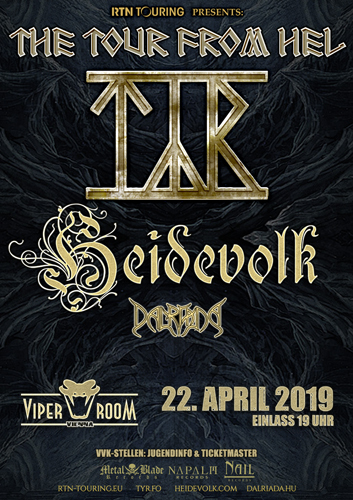 As a co-headliner Heidevolk presents you the ageless story of revolt and resistance captured in their most varied and mature release to date called “VUUR VAN VERZET“.